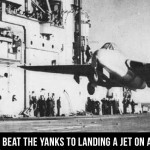 The United States Aircraft Carrier – It is known as 4.5 acres of sovereign American territory. On its decks, inside its islands, down in the berthing compartments, serving in the chow hall, machine shops, electrical shops, laundry rooms, and ship’s stores, over 5,000 Sailors and Marines keep this small city moving 24 hours a day, 7 days a week. A carrier like the USS George Washington (CVN-73), nicknamed The GW, is a Nimitz class aircraft carrier. It is propelled by two Westinghouse A4W nuclear reactors and can reach speeds of over 30 knots. The GW has four catapults and, with an entire air wing aboard, carries around 75 fixed wing like the F-18 Hornet and helicopters. 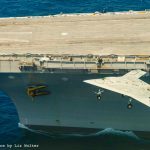 The United States has eleven carriers — ten belonging to the Nimitz class, and the USS Gerald R. Ford is in its own class entirely. The carrier is a projection of America’s military power around the world. These superstructures have everything a small city would need to function. To the civilian, these mammoth ships are very intriguing. 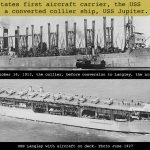 Did you know a carrier not only has a bridge and a flight deck, but also a hangar deck, weight rooms, berthing areas, chow halls, their own post offices, and even a brig (jail)? If you want to see an active United States carrier up close you will need to go down and see a recruiter. Otherwise, if you have a family member currently serving on a carrier, you can take part in a “Tiger Cruise”, where family members are invited aboard a ship that is underway to experience where their sons and daughters live and work. 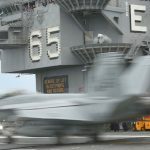 For the rest of us, we have the public relations departments onboard ships like the USS Carl Vinson (CVN-7) to thank for multiple videos of day-to-day life aboard a U.S. carrier. On Youtube, there are also civilians filming their tours on these ships as special guests and are generous enough to upload their videos. We have included multiple links below for you to experience it for yourself. As a bonus, we have also shared an article by Yank Rutherford, RADM U.S. Navy (Ret. ), who shares his experience as commander of the aircraft carrier USS George Washington from 1997-2000.